I awoke just before the ten teenage girls, whose shrill laughs continued at 6 am this morning! I planned for an early rise, so I could get to a few of the hot spots before the crowds. Also, I knew at times I was going to have to leave Petey and VANilla, so I wanted to make sure it was cool for him. After loading up VANilla and boiling some water for coffee and oatmeal, we made our way toward the valley around 7 am. 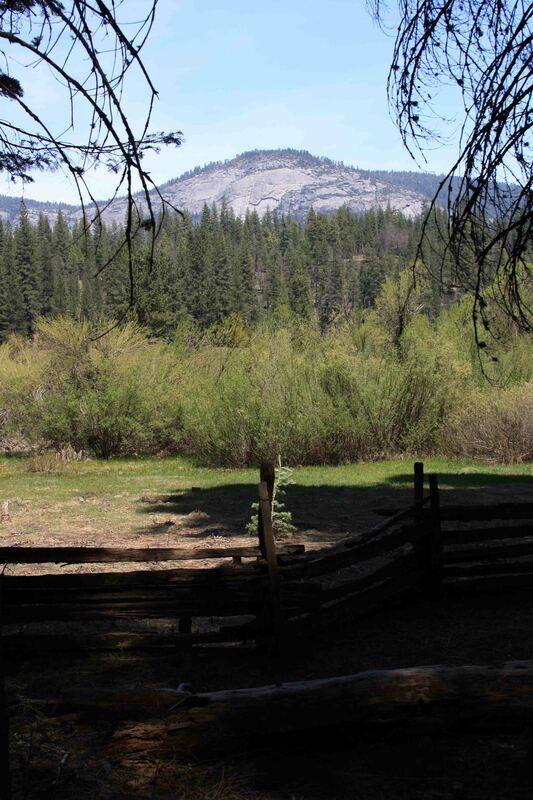 I didn’t plan to be in the northwest corner of the park again, so I stopped off at the other end of Tuolumne Grove Road as we didn’t complete the eight mile roundtrip last night. 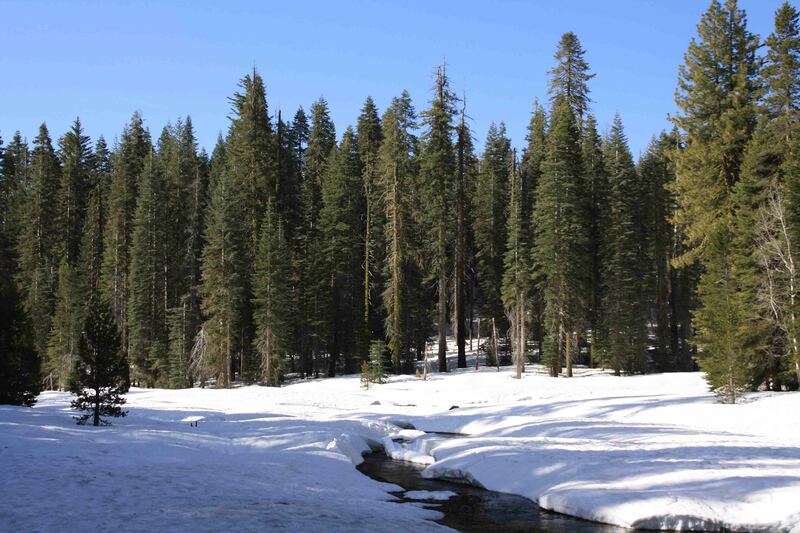 The grove of giant sequoias can be found about a mile into the walk along the road which today was covered in packed snow for about a third of the way. I jogged the paved portion and walked the snow portion to finally arrive at the Dead Giant, a stump with a tunnel cut through it in 1878. It was quite an interesting site. Two spires of bark towered on either side, while standing in the tunnel I could look up through the middle of trunk to see the blue sky above. I managed to leave my SD card in my computer instead of transferring it to my camera, so no picture. 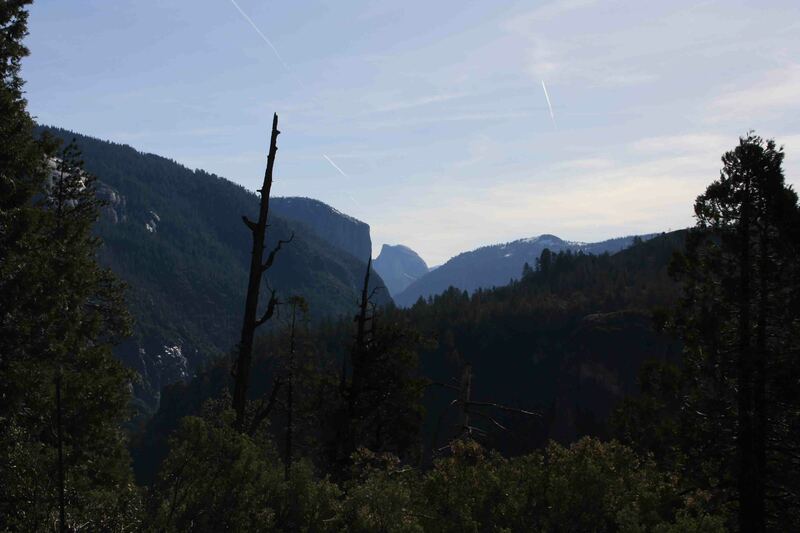 We left Tuolumne Grove and twisted and turned along 120 toward Bridalveil Fall in Yosemite Valley. We stopped in a handful of pullouts along the way to admire Cascade Creek which seemed more like a raging river and to take in one of many views throughout the park of Half Dome. 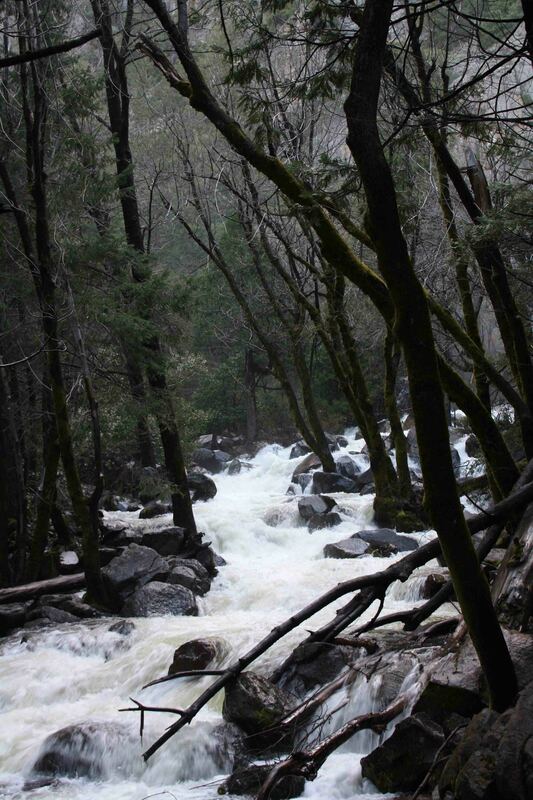 Eventually, we made it to the valley and made Bridalveil Fall our first stop. The short walk to the falls was along a paved sidewalk. The walkway led to a vista point near the base of the falls where ice cold water flowed over my feet as the river swelled out of its banks. 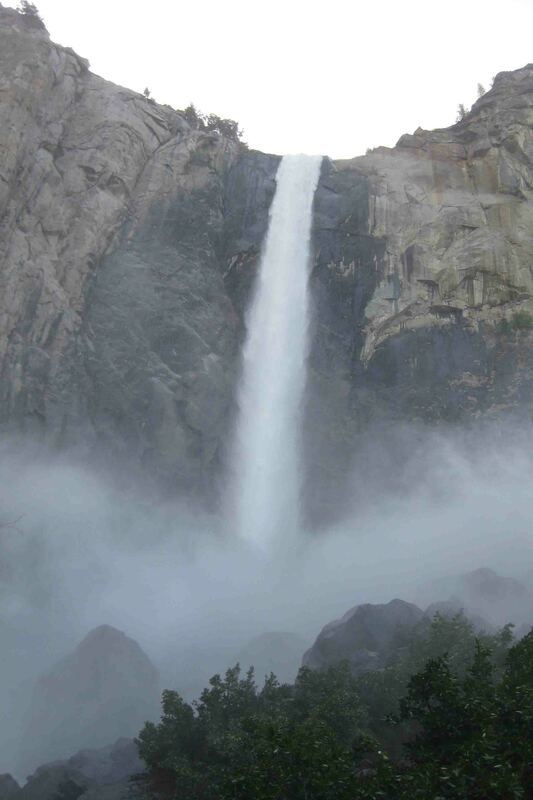 As the falls plunged 600 feet over a sheer rock face, the breeze directed a fine mist into my face. The chill in the air coupled with the frosty water lent to a short visit. We continued along the six mile loop to one landmark after the next: Ribbon Fall, El Capitan, Upper Yosemite Fall, Lower Yosemite Fall, Curry Village, and Yosemite Village. At first, I stopped at every pull out. Then I decided to take the drive around the valley to get my bearings as I have a few days to enjoy the sights. 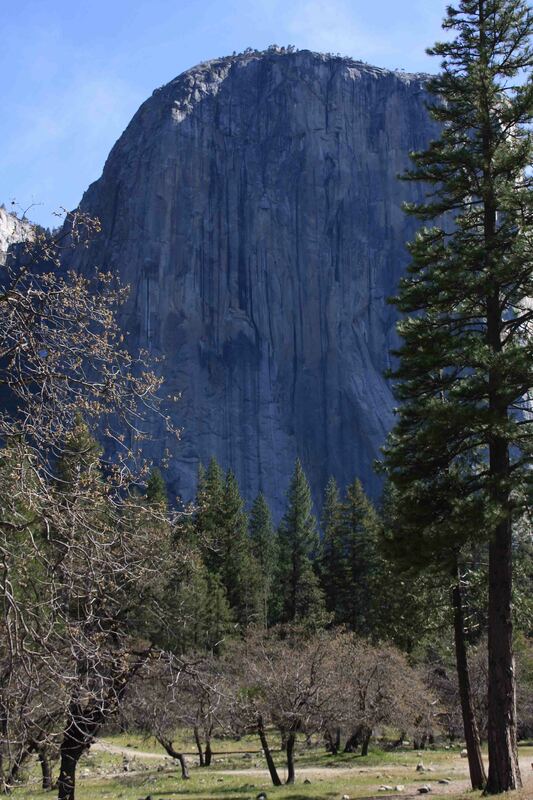 El Capitan, one of Yosemite’s best known wonders, is a sheer granite monolith that rises 3,593 feet above the meadow. The durable granite is able to withstand the pressures of glaciers and erosion. It was first scaled in 1958. Since then, climbers have explored hundreds of routes. I’m certain there were climbers up there today, as the weather was glorious, but they were too small for me to see! 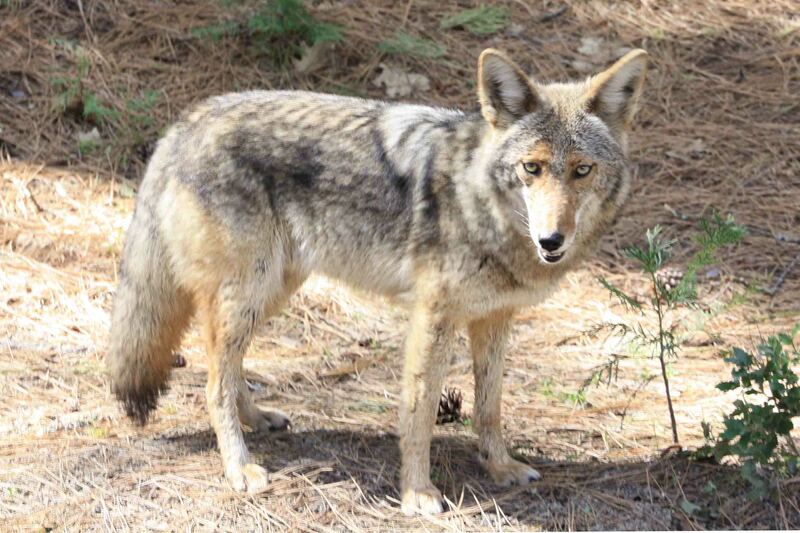 Just after we left El Capitan, I ran across two coyotes sitting on the side of the road. I literally stopped VANilla right in the middle of the road – totally annoying tourist move – and snapped a photo right out the passenger window. They hardly moved…and I was looking for a bear…the ranger at Bridalveil Fall said a few bears had been spotted by the river near El Capitan. 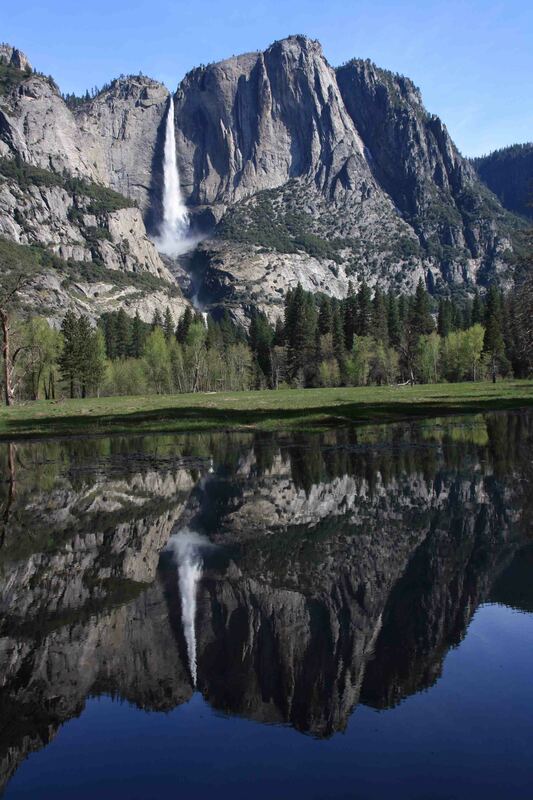 My final stop before simply driving the loop to scope out the valley was at swinging bridge which afforded a beautiful view of Yosemite Fall which reflected in the glassy Merced River. Looking at the smooth waters, it’s hard to believe the river is cresting and the rangers may have to move some campers. That is one of the reasons why finding a campsite has been somewhat difficult…not to mention that all the first come, first serve campgrounds are closed due to the immense amount of snowfall this winter. I replied, “Ok, great”, but clearly with not enough enthusiasm for him. As Petey and I proceeded, I commented, “Then I guess I’m lucky”. 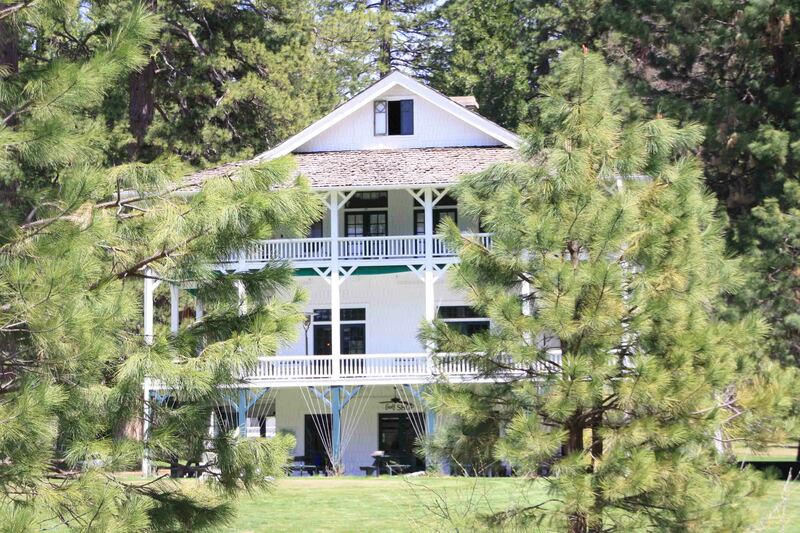 We spent the next hour or so looping around the meadow, soaking our feet in small creeks that crossed the road, trouncing through mud, admiring Hotel Wawona, and finally ending our journey strolling up a fairway on the hotel golf course. We never saw any red flowers. In fact, we hardly saw any flowers at all. I asked another couple I met along the way if they had seen any. They both said no. Oh well, I wouldn’t have known to look for them in the first place. 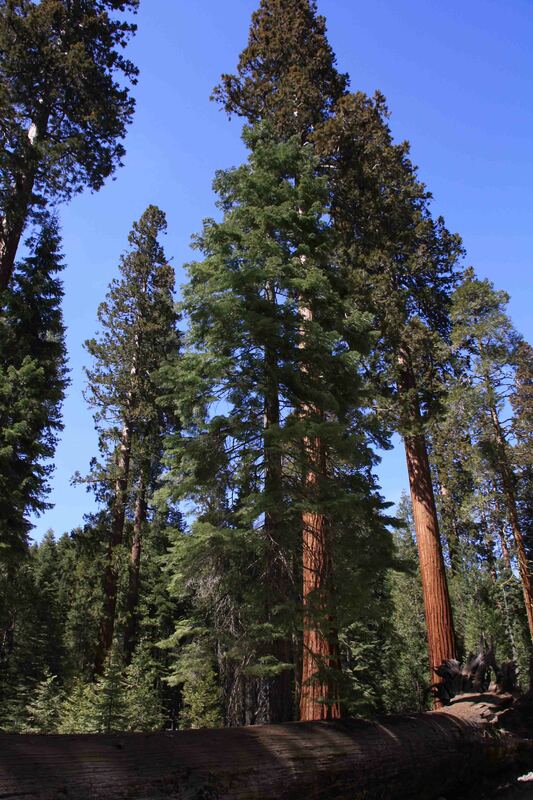 One more attraction in the southern part of the park is Mariposa Grove, another grove of giant sequoias. I think I saw so many redwoods a few weeks ago, that I was pretty “treed out”. I took a short walk through the grove to a few of the main attractions: Fallen Monarch, Grizzly Giant, and California Tree. 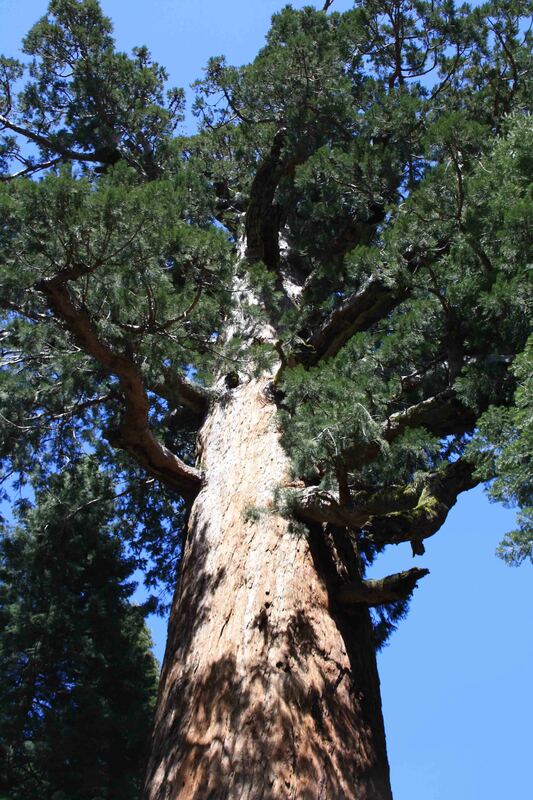 The Fallen Monarch is a giant sequoia that fell centuries ago. Its tannin rich wood keeps it resistant to rot and unpalatable to many insects, thus the tree remains intact. From 1891 to 1914, when cavalrymen of the US Army road from San Francisco to Yosemite to protect the park, they used to ride their horses onto the fallen tree and pose for a photo. The Grizzly Giant, standing relatively short at 209 feet, is as tall as a 19 story building and exceeds the length of a 747 as well as the height of Statue of Liberty. Its base, 96 feet in circumference and 28 feet in diameter, is blackened with fire scars. Estimated at 1800 years old, imagine how many fires this tree has withstood with an average fire frequency of 5-20 years. The Grizzly Giant has a “snag-top” due to its inability to move water from the roots to the crown caused by the large fire scars. About halfway up the tree, one if its limbs that turns upward is 7 feet in diameter. The California Tree is a tunnel tree, one of at least three I now know of in the park. The one I failed to get a picture of this morning, a fallen one within the Mariposa Grove, and this living one. The tunnel was cut in 1895 to promote tourism. 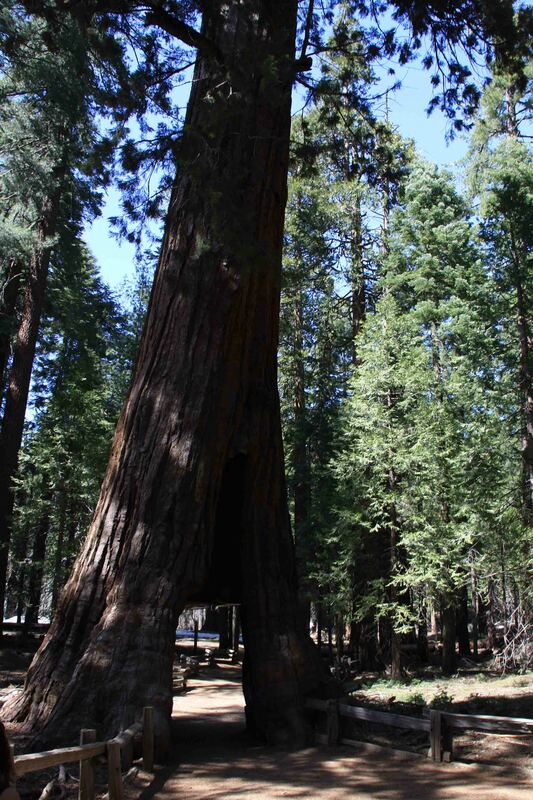 This tree and the fallen Wawona Tunnel Tree were helpful in publicizing Mariposa Grove which led to its inclusion in Yosemite National Park. 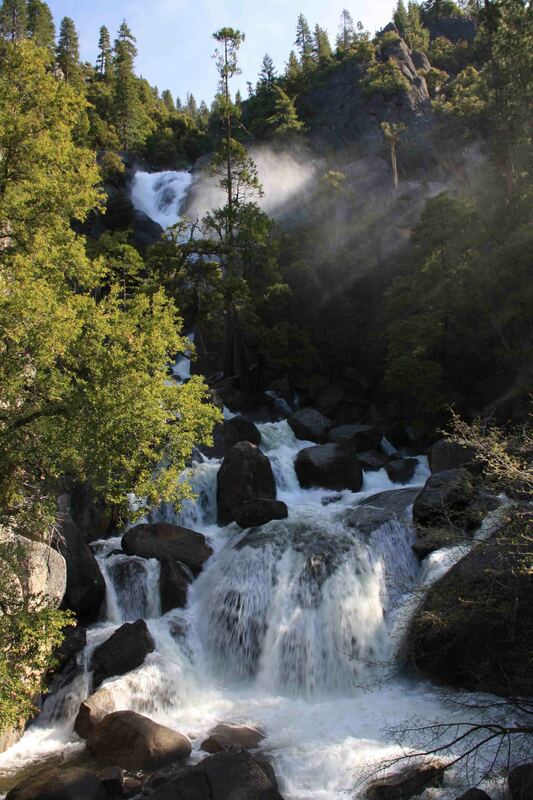 Loved the Yosemite Fall picture from the swinging bridge!!! That’s my favorite too. Lucky for weather conditions to be so calm!